Magnetic tornadoes were found in Mercury's magnetic field. The pink area represents the magnetopause. 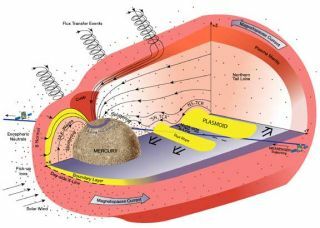 The tornadoes are technically known as "flux transfer events" (twisted lines) when they form at the magnetopause and "plasmoids" (yellow areas) when they form in the long magnetic "tail" extending from the night-side of Mercury. They act as open channels through which the solar wind can flow down to the surface of the planet and sputter neutral atoms into Mercury's atmosphere.